Enjoy your ride! Smart Bikes by Infralobo sets you free to explore Vale do Lobo and its surroundings on two wheels. Smart Bikes by Infralobo is designed to provide all users with a seamless cycling experience. Become a member and use the Smart Bikes by Infralobo regularly. Want to use Smart Bikes by Infralobo regularly? Choose your membership type and enroll here. You can activate the membership card on the website or begin using the system with the Smart Bikes by Infralobo Mobile App.The initial registration necessary for the use of the Shared Bicycles, named Smart Bikes by Infralobo, is carried out with the system managing entity (INFRALOBO) through the form available on the website or at the service desk at INFRALOBO offices. It is mandatory to present the Citizen Card/ Identity Card/ Passport, to certify the ownership of the contract established with INFRALOBO, for natural persons, or a copy of the company's commercial certificate, in the case of legal persons. Walk to a station, choose your Smart Bike, and unlock it with your membership card or the Mobile App. Walk to a station, and choose your bike. Ride through Vale do Lobo and explore its surroundings, then return the bike to any docking station when you are finished. The first 60 minutes of every ride is free even after the experimental period. Tap your card on the screen located between the handlebars, or gain access directly on the Mobile App. Stations can be found on the Infralobo Maps or on the Mobile App. As you enjoy your ride, use the convenient bike screen to keep an eye on your time. The first 60 minutes of each ride is included in all menbership’s. Keep an eye on the clock or the timer on the bike to return the bike accordingly. When you’re ready, to park your bike, place the lock in its slot and wait for the locking signal to turn on. The bike will still be rented under your name and the timer continues to run until you return it to a docking station. Then you can continue your ride. Choose any station and park the bike in the dock. When you see the “docked bike” indication appear on the bike screen or hear the return sound, you have properly returned your bike. When you’re ready for your next ride, go to any station and do it again. - Our technology recognizes when stations are full, and you can call us on +351 289 352 430 to request free additional time and move to another station. - You can also contact us at +351 289 352 430 to create a virtual space at your current location and dock your bike using the secondary lock. To do this, simply activate the bike’s secondary lock by placing the lock in its slot. The bike screen and sound will indicate that the bike has been locked. When the secondary lock is used in a virtual zone near the station, the bike is considered returned and your rental will end. Register on the website, choose one of the resident exclusive subscriptions and receive a membership card and user login. With a subscription you have the freedom to use Smart Bikes by Infralobo as many times as you wish every day for 60 minutes periods. During the experimental period the system is free of charge, after which the respective costs for use will be approved. You can ride for 60 minutes periods as many times per day as you wish. If you change your bike in a station the 60 minutes period will restart. If you have a problem, please call customer service at 289 352 430. You can choose to ride for longer periods of time if needed. Simply lock your bike in a station and pick it up again for another 60 minutes period, and enjoy the experience. After 24 consecutive hours, if the bike has not been returned, it will be considered stolen and a fee of 2.500€ will be charged to your credit card, unless reported to INFRALOBO differently. If you have a problem, please call customer service at +351 289 352 430. 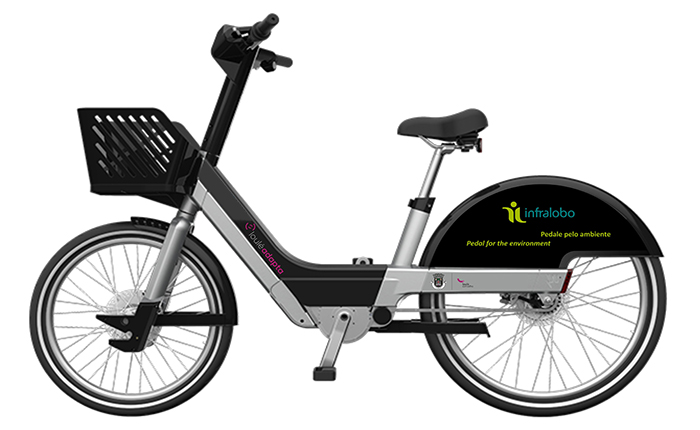 The Smart Bikes by Infralobo system is a network of 30 Pedelec (electric bicycles) and 5 stations, conveniently placed to service the magnificent region of Algarve. Residents and visitors have access to our system every day, for the whole year. Having access to a bike has never been easier, with simple membership offers available online, through our Mobile App, and directly at our offices. Want to know the impact of the Smart Bikes by Infralobo in Infralobo intervetion area? Check out how we’re doing. Everyone is invited to use our data to analyze and study the positive impacts Smart Bikes by Infralobo is having on the area.